Earlier this week Topps released the Hobby/Collector sell sheet for 2019 Series 1 Garbage Pail Kids We Hate the 90’s. Thanks to Wildwood Enterprises we are able to bring you the retail sell sheet. 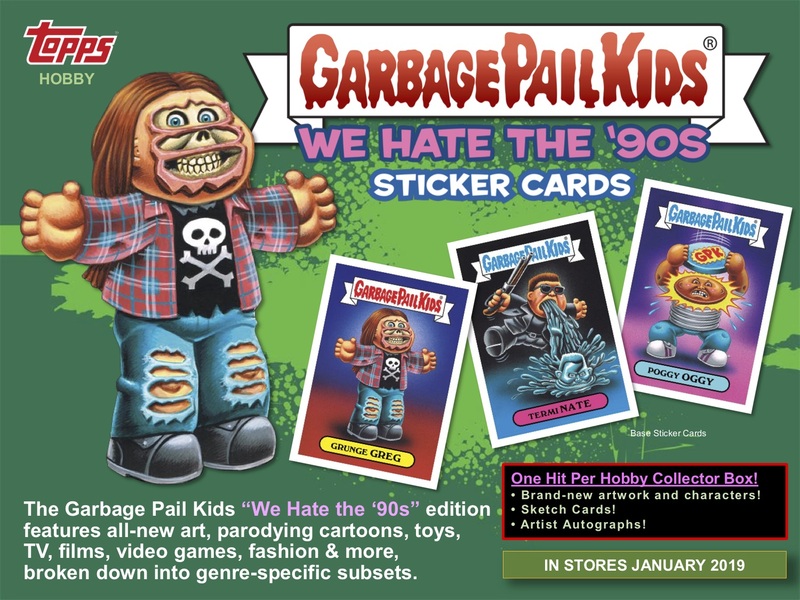 The first set of 2019 is shaping up to be almost a sequel to 2018’s We Hate the 80’s set. Just like with this month’s 2018S2 Oh the Horror-ible set, the base set will contain 200 cards, (100 new paintings in a/b versions). This is the last set that Colin Walton was the Art Director/Editor on. The majority of the set was complete prior to him leaving Topps. The formula is much the same as the previous sets. The decade of the 90’s will be parodied in a handful of subsets. Topps however, is making a few changes to the insert lineup. In perhaps a bit of a surprise, Gravity Feed boxes are being offered by Topps for the 90’s set. 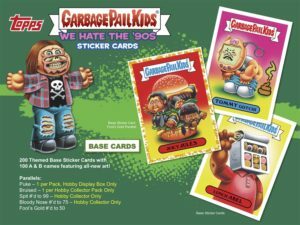 After offering them initially for 2018S2 Oh the Horror-ible, Topps announced a short time later they were cancelled. The fate of Gravity Feeds for the 90’s set will rest on weather Target wants to order them. You can expect more cancellations if retailers don’t order the feeds. To hedge their bets, Topps states on the sell sheet that the Classic 90’s Insert set will appear in both Gravity feeds and regular retail display boxes, (also marketed as Hobby boxes). This way if Gravity feeds are cancelled again, the insert will still appear in retail packs. Previously the “Classic” insert sets were found in Fat Packs. Not only has the set moved pack types, but will now be 10 cards instead of 20. 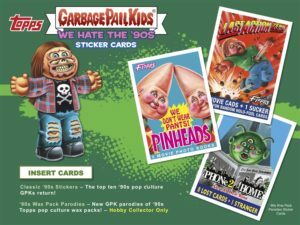 The set is described as, “The top ten 90’s pop culture GPKs return!” Puke (Green) parallels will return 1 per pack in all retail pack types. Fool’s Gold borders randomly inserted in all pack types are also back and limited to /50 of each. What is not mentioned on the sell sheet are the Phlegm (yellow) parallels. Previously found only in Gravity Feeds, the yellow borders rarely made a mention on past sell sheets. So it remains to be seen if Gravity Feed boxes return, and if Phlegm parallels join them. Finally as always, artist autographs, printing plates, and regular sketches can be found in all retail pack types. While there are many questions around gravity feeds and regular retail boxes, the same can’t be said for Blaster boxes. The same exact formula is being followed as with 2018S2 Oh the Horror-ible. Once again there will be two different Blaster versions, and once again Bathroom Buddies will appear in both. 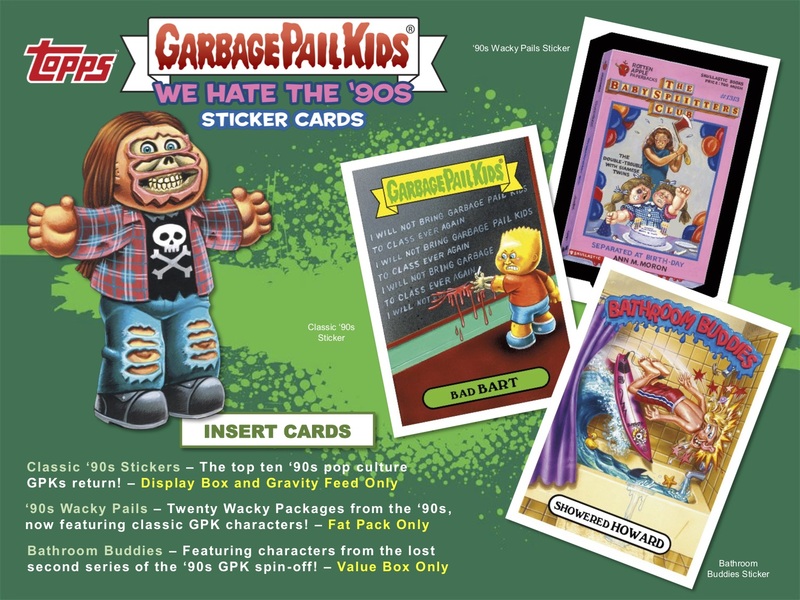 Both boxes will contain 3 cards from the “lost second series of the 90’s GPK spin-off” Bathroom Buddies. The only difference in boxes appears to be one will have a $9.99 price label, and the other box without. Blaster boxes will continue to have 5 packs each, and contain 16 boxes per case. The popular Loaded Puzzle sketches will be randomly inserted into Blaster boxes once again. Fat Packs will also follow the same formula being used for 2018S2 Oh the Horror-ible, with one change. The hanger packs are roughly twice the size of a regular retail pack. 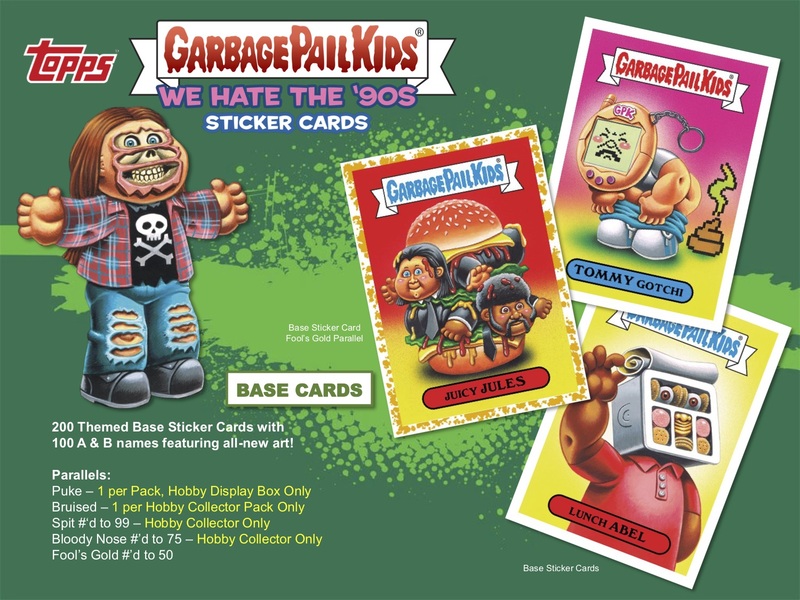 Each pack will come with two Puke parallels. 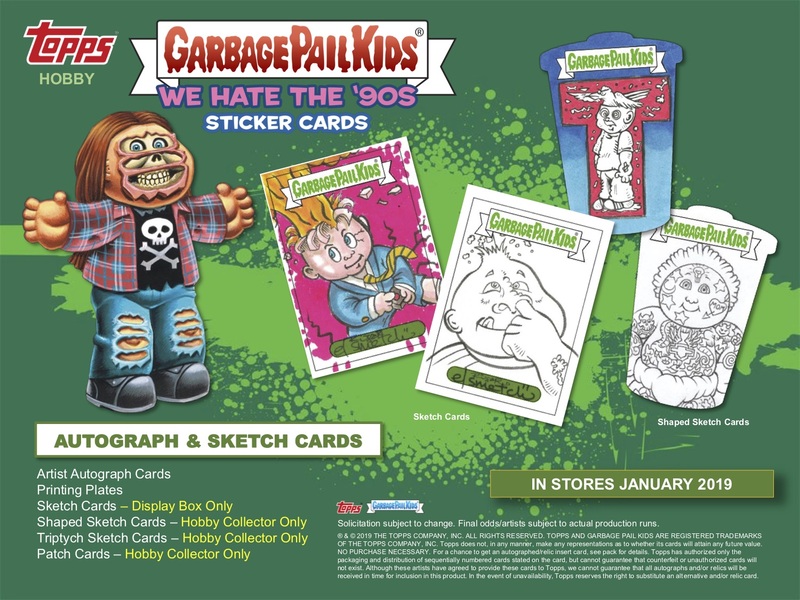 The packs will also feature two cards in the new 90’s Wacky Pails insert set. The insert set is describes as, “Twenty Wacky Packages from the 90’s, now featuring classic GPK characters!” The new Jelly parallel, expected to debut in the 2018S2 Oh the Horror-ible set, will be returning once again, falling at a rate of one per pack. Finally, Panoramic Sketch Cards will also be randomly inserted into Fat Packs. To view the Retail sell sheet as a PDF click here, or check out the pictures below. 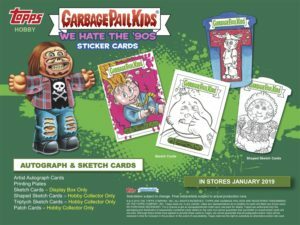 2019 Series 1 Garbage Pail Kids We Hate the 90’s is set to release Jan. 16, 2019. Time to bust out your Pogs, listen to a little grunge, all while eating a Lunchables. Topps is taking on the 90’s! Topps artists have been finished painting the finals for the next set for a few weeks now. 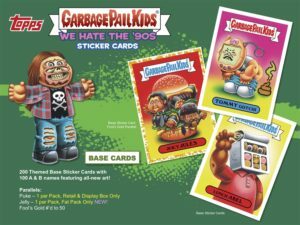 Today today officially announced the next retail set, 2019 Series 1 Garbage Pail Kids We Hate the 90’s. This set is a bit of a sequel off the popular set from earlier this year, We Hate the 80’s. This time the set will feature parodies of cartoons, toys, TV, films, video games, fashion, everything 90’s. This is the last set featuring Colin Walton as Art Director/Editor. The set was nearly complete when Colin left Topps. Just like with the upcoming Oh the Horror-ible set, the next set will feature 200 cards, made up of 100 new pieces of artwork available in a/b versions. The set will continue the practice of being broken into various subsets. The familiar parallel format will return. 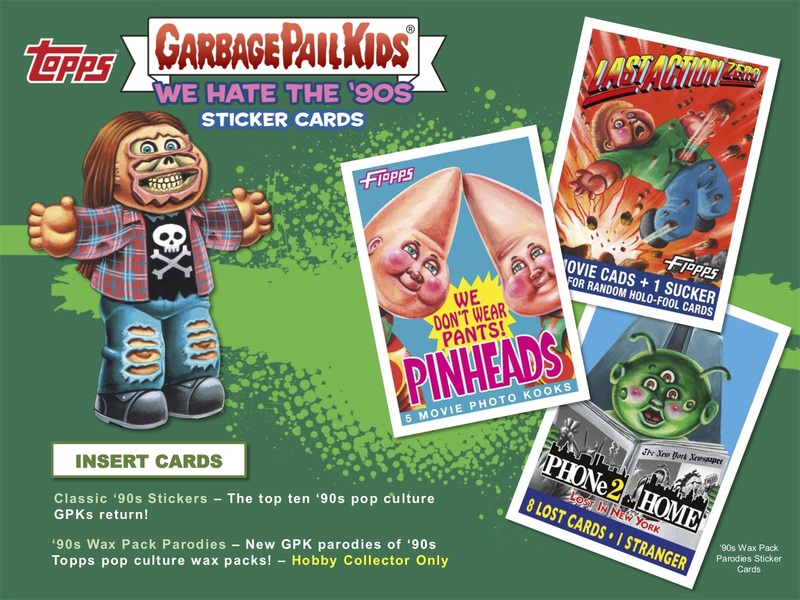 All Hobby and Retail packs will contain one Puke (Green) parallel. Fool’s Gold parallels will once again be numbered /50, and are available in all pack types. Also, Bruised (Black), Spit (Blue) /99, and Bloody Nose (Red) /75 parallels will only appear in Collector packs. There are two types of insert cards mentioned on the Hobby sell sheet. 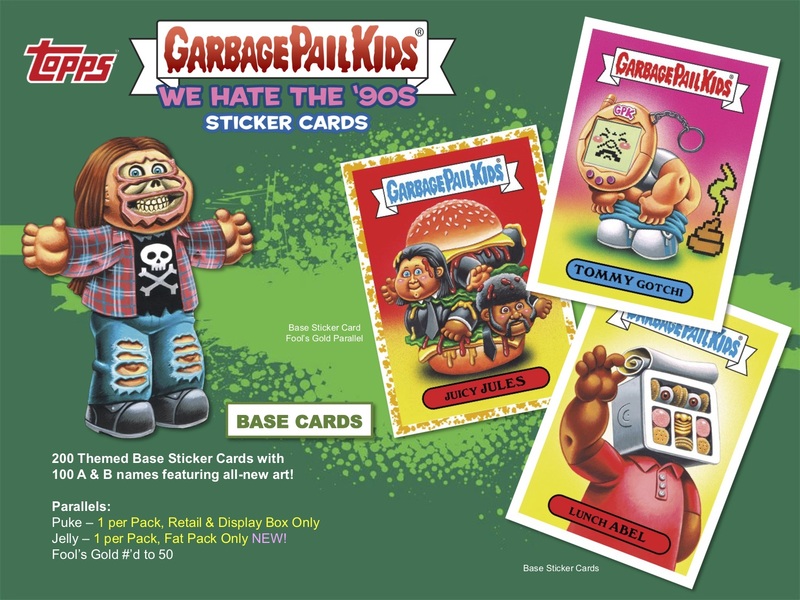 90’s Wax Pack Parodies, which will fall 1 per collector box, and also Classic 90’s Stickers. The Classic inserts in the past have been a retail Fat Pack exclusive, but it appears they might be appearing in other pack types this time around. Artist autographs and printing plates will continue to be found in all pack types. Collector boxes are once again guaranteed one hit per box, either a shaped sketch, artist auto, printing plate, or patch card. Regular sketches can be found in retail pack types, while shaped sketches and triptych sketches are collector box exclusives. Patch cards will also be found only in collector boxes. Once again the overall construction of the set is familiar to the other theme sets released the past few years. Once we get retail sell sheet info, I will pass it along. For now you can see the sell sheet here in PDF form, or check out the pictures below. 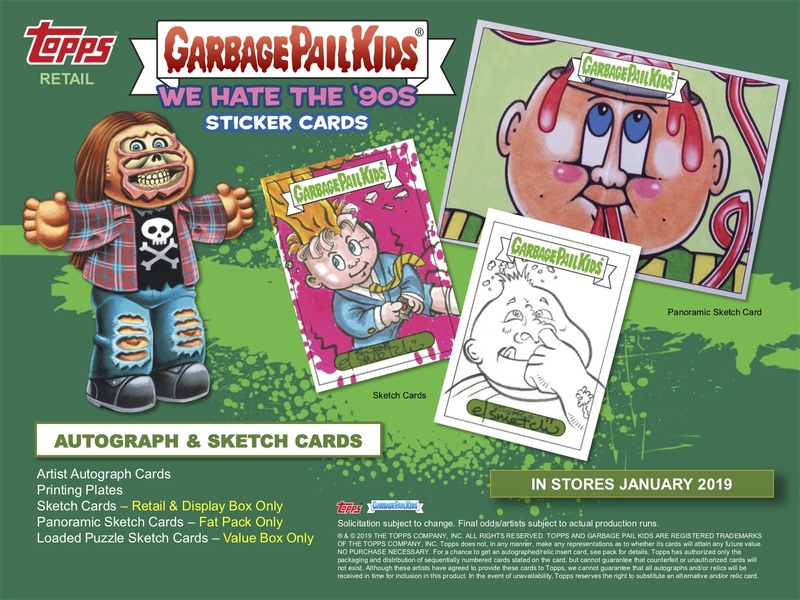 2019S1 GPK We Hate the 90’s is set to hit stores on Jan. 16, 2019.